This is to inform all members, supporters and the public that the national centre of the Democratic Socialist Movement (DSM) has moved from 162 Ipaja Road, Agbotikuyo, Agege, Lagos to 49, Charity Road, New Oko-Ob,a Abule Egba, Lagos. We write to appeal for generous donations towards the running of the Democratic Socialist Movement (DSM) and our intervention in workers, students and poor masses’ struggles over the next three months. This include running of the secretariat, visit to branches, payment of rents, allowances of full time and part time officers, production of the new edition of our paper, our contribution to the campaign for the registration of the Socialist Party of Nigeria (SPN) and our intervention in struggles of workers, youth and poor masses against the neo-liberal attacks of the Buhari/APC capitalist government. The National Committee (NC) meeting of the Democratic Socialist Movement (DSM) held over April 16 to 17 took place as important changes are beginning to be seen as Nigeria's many crises and the new government's inability to stop the rot is resulting in growing pressure from below for something to be done. Pressure which has resulted in the trade union leaders threatening to call a "one-day national warning strike/protest", although up to now no date has been announced. The Democratic Socialist Movement (DSM), Osun State Chapter's April 3 second quarter symposium saw a lively discussion on Osun's Economic Crisis: What caused it? What are the solutions? The subtheme was, One Year after Buhari's Victory: What has changed? In attendance were workers, retirees and members of DSM. 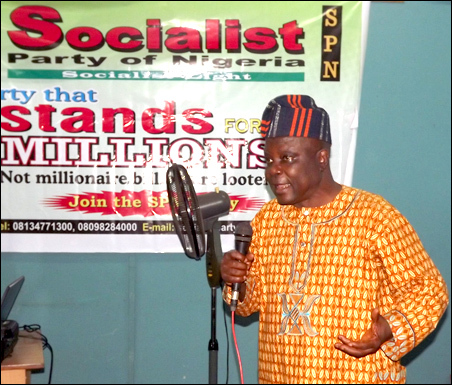 In mid-January the Lagos State Chapter of the Democratic Socialist Movement held its first aggregate meeting of the year on 16 January, 2016 to discuss the anti-corruption fight of the Buhari regime which has seen several elements alleged to have taken part in the monumental fraud called the “arms deal” brought to trial. NIGERIA'S MESS: CAN BUHARI CLEAN IT UP? The Lagos State Chapter of the Democratic Socialist Movement (DSM) held an end of year public meeting which brought together new contacts and supporters encountered in workplace interventions, students’ movement activities and community campaigns. The meeting was held at a period when an avalanche of neo-liberal attacks such as the electricity tariff hike and imposition of tolls on the highway is expected. The Lagos State Chapter of the Democratic Socialist Movement (DSM) held its aggregate meeting on Saturday, November 21, 2015. In declaring the meeting open Ayo Ademiluyi, who chaired the meeting, noted that the meeting was taking place at a period of dramatic events in the socio-economic sphere including but not limited to widespread fuel scarcity, dip in electricity supply among several other agonizing conditions of the working masses. 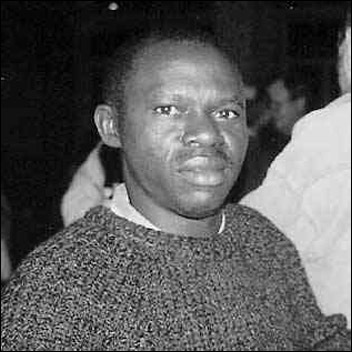 Operatives of the Department of State Security (DSS), apparently at the instance of the Osun State Government, have arrested Comrade Alfred Adegoke, Osun State Chairperson of the Socialist Party of Nigeria (SPN), and Osun State Coordinator of the Democratic Socialist Movement (DSM). He was picked up at his office today around 11.20 a.m. He was brutalised by the heavily armed DSS operatives. Other members managed to escape. He was later released by 2pm. For about six months, between the last National Committee (NC) meeting of Democratic Socialist Movement (DSM) held in April and the national meeting over the weekend of October 11-12 the need for the socialist transformation of Nigeria has continued to manifest in the country in all socio-economic and political spheres. The absence of a genuine alternative has triggered a growing apathy among the working people as revealed by the relative low turn-out at the recent elections in Ekiti and Osun states. The Labour Party formed by Nigeria Labour Congress (NLC) has long become the trashcan of anti-poor capitalist politicians. The recent purported interest of the trade union leadership in the party following the return of the Governor Olusegun Mimiko to the PDP is half-hearted and mere blowing of hot air. We are republishing this obituary to mark the 10th anniversary of the death of Rotimi Ewebiyi who played a key political and organisational role in the building the DSM during the military dictatorship and the first years of civilian rule.